We will look at and discuss the artwork of John James Audubon and Charley Harper and how they had different purposes, but both depicted nature (specifically birds) but for different purposes. 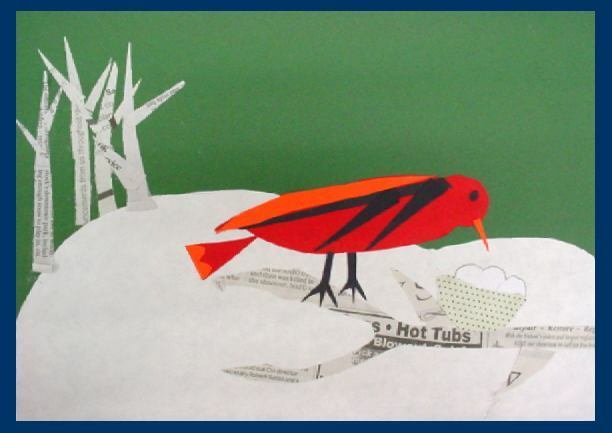 Students will then pick out bird pictures from nature magazines and create a construction paper collage in the simplified style of Charley Harper. Art has a variety of purposes and can supplement many subject areas and professions. Nature is often an important source of inspiration for artists. Usually the things we see around us can be broken down and simplified into basic shapes, which makes them visually and practically easier to see and draw. Compare the artwork, purposes, and styles of Audubon and Harper. Choose and use photographs of birds in nature for inspiration of their own artwork. Simplify birds into basic shapes and plan a composition to create a piece of work in the style of Charley Harper. Click on images for full size. Images from Mrs. Knight's Room. Four untitled bird prints by Charley Harper. (I found these on Google Image Search) You can also see several of his images in the Charley Harper Calendar . 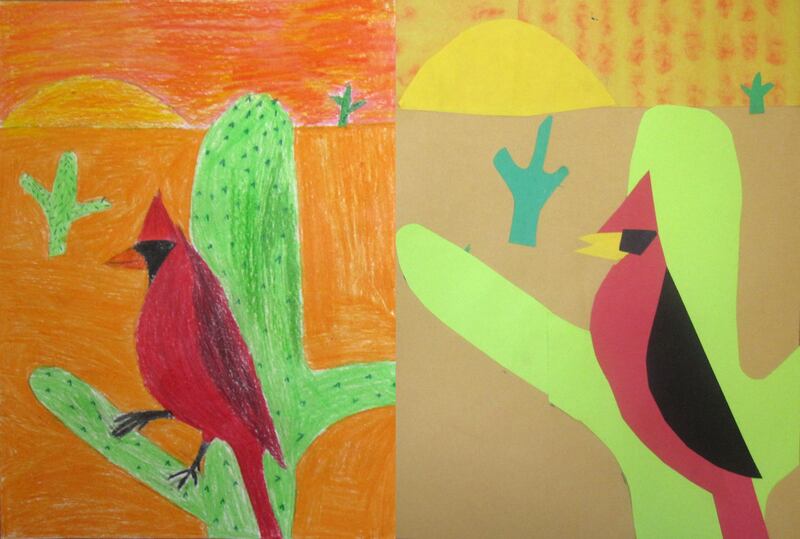 See more examples from a Charley Harper collage lesson. Ornithology is the branch of zoology concerned with the study of birds. Shape: Lines than connect an enclosed space. Do any of you hunt or help your parents outside in the garden? Did you ever think that hunting or gardening and art could be combined? Well, in the early 18th century, there was an ornithologist (person who studies birds) and artist named John James Audubon who did just that. He was an Englishman, but his primary focus was to come to the United States and record many of the bird species that live here. Back then, our country was still a vast, mysterious landscape to many Europeans, so Audubon came here to do research and draw many birds so others could see what they looked like. As a class, fill out a Venn Diagram worksheet on things about Audubon and Harper that are similar and different. How did they make money with their artwork? What was their purpose in making their kind of artwork? What materials or medium did they use? 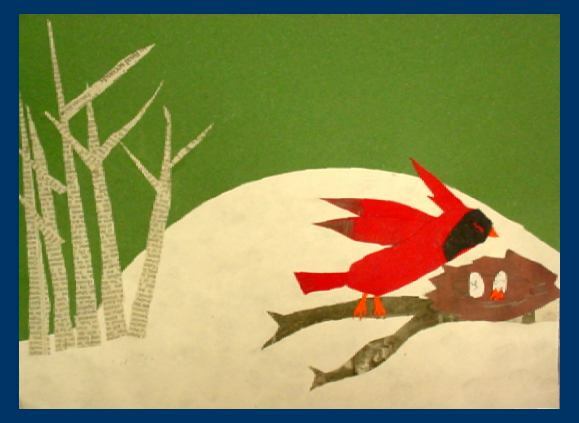 Students should also look at the bird’s habitat and include a few branches, grasses, flowers, snow, berries, etc. that can be found and also simplified to balance and bring more interest to the composition. Colors are not similar to those in the picture. More than half the colors chosen do not match or connect with those in the picture. Colors are similar and generally match those in the original picture, but one or two may be off. Shapes are sloppy and don’t work together to appear bird-like. Shapes are cleanly cut and fit the areas of the bird. 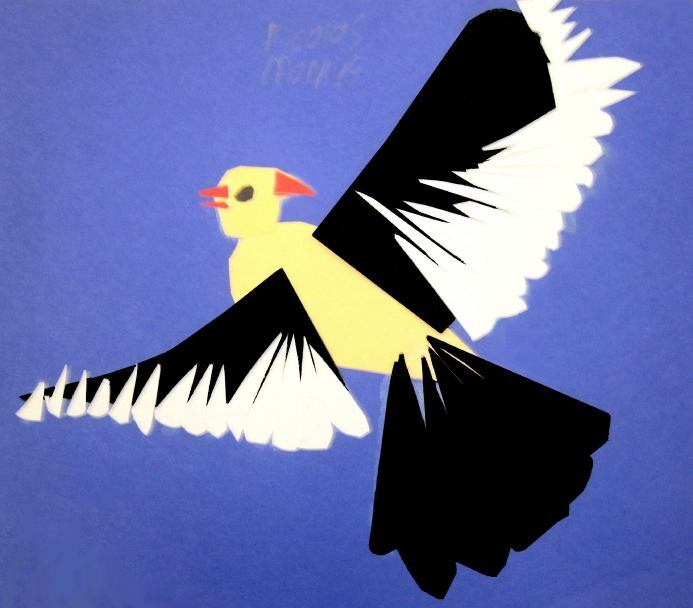 The overall affect appears similar to the style of Charley Harper. Shapes are very clean and crisp. The design looks very much similar to the original bird, reflects the work of Harper, and has impeccable detail. Composition is unbalanced and unlike that of the original, or not included. Lacks similarity to the original, but is mostly balanced. Composition is balanced and close to that in the original. Composition is balanced and detailed. Sloppy with poor cutting lines, glue apparent or incomplete. Lacks a general neatness and clean lines. Project has clean lines and glue usage. Project has exceptional quality with clean lines and detail.